“Tree-planting is commendable, but so is protecting and conserving our existing trees. ” said Latha, a member of the NGO Nizhal, during a tree walk organised at the Queen Mary’s College, coinciding with the Madras Week celebrations. Such events, she added, apart from identifying trees, can also arouse curiosity and establish a sense of kinship. During the drive, which comprised a group of botanists and school students, Latha said that one must look for factors such as leaf and shape of flowers, identifying a tree. 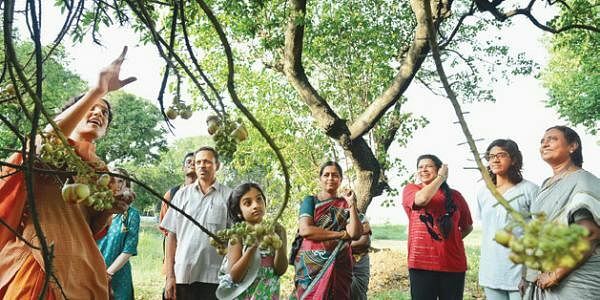 Pointing to the poovarasa tree within the campus, she said that since its leaf was identical to that of the arasa tree (sacred fig) and that it flowered, it was known in Tamil by that name. The botanists present elucidated on its medicinal values. Balu, who was also present, explained the features of the Nagalinga poo or Cannonball tree. “The tree got its name as its flower resembles the hood of a snake, while its fruit a cannonball,” he said. Seeking to dispel myths surrounding the Ashoka tree, he said that it was perceived to be unwanted as shoka means sorrow. “The tree trunk is of low density and was used in the construction if ship masts,” Balu added. He also pointed out that its leaf was commonly confused with that of the mango tree. Next on the itinerary was the banyan tree. “Its derives its name from the fact that the Bania community used to hold their shops underneath these trees,” he explained .